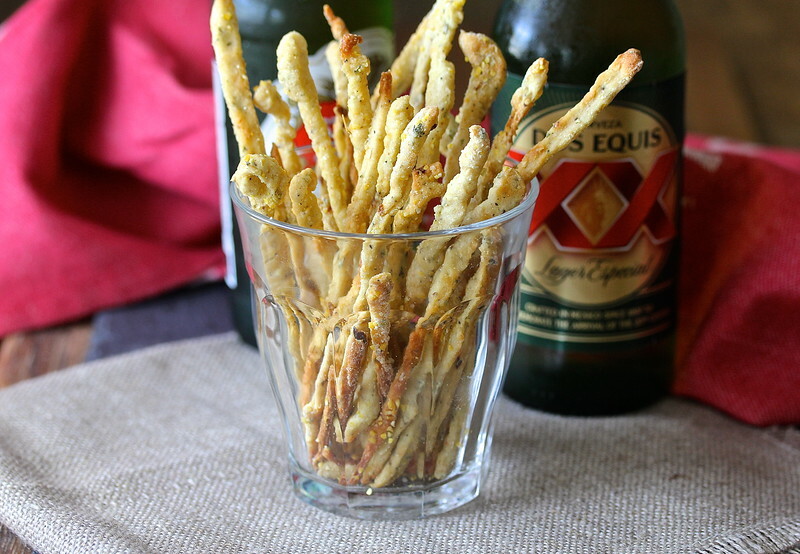 These Crushed Red Pepper Grissini are super spicy, skinny, and crunchy. They are the perfect bar snack, and excellent with a glass of wine or a beer. These grissini are loaded with Parmesan cheese, herbs, hot sauce, and just the right amount of crushed red pepper, at least for me. You see, I'm a huge fan of crushed red pepper. Don't tell anyone, but I keep a shaker of it in my desk at work, just in case there's a crushed red pepper emergency. For example, what if a pizza party breaks out and the pizzeria didn't send along any? Total emergency. I actually own it in two strengths, medium hot Italian/California style (similar to what you will find in your grocery store), and very hot Indian style (which I found at Penzey's). I'm crazy about spicy foods, and add a little bit of this stuff to just about everything except dessert. When Sue of Palatable Pastime suggested the theme of peppers for this month's #BreadBakers theme, I was so happy! Did I mention I love spicy food? These grissini are really fun to make. You will need a pasta maker to get the grissini super skinny. I used this one. Yes, I'm probably the only person who owns a pasta maker who has never actually made homemade pasta. If you don't have a pasta maker, you can use a rolling pin and a pizza wheel, but if you want these to be really, really skinny, use a pasta maker. I had fun making these with my grandson. I enlisted his help to turn the crank on the pasta maker, and I'm pretty sure he was skeptical, until I mentioned they are spicy like Takis or Spicy Cheetos. After that, he was completely sold. He took some to his summer camp to share with his friends, and reported back that they were a huge hit! Much better than packaged snacks, right? These are REALLY hard to stop eating. I'm just saying. Note: You really can't go wrong with these. Use as much cornmeal as necessary to manage the dough, and if you mess up during your first pass through the pasta maker, just roll the dough out again, let it rest, and run it through the pasta maker again. 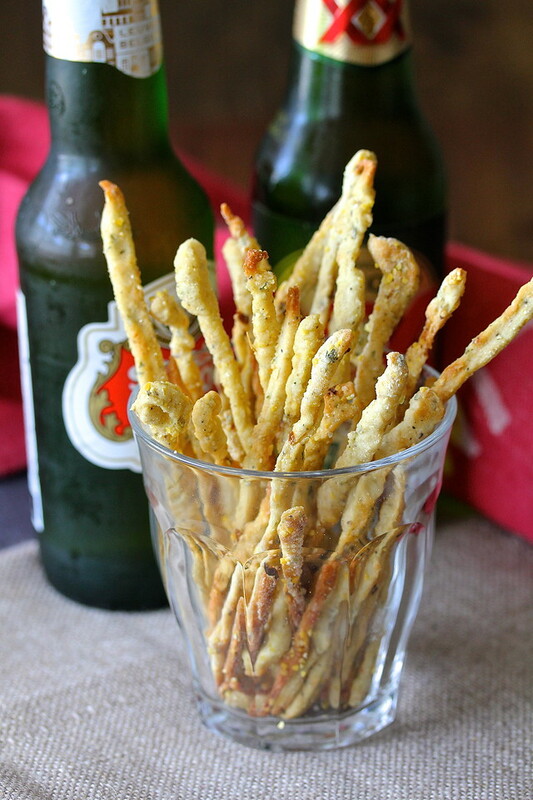 Here's a version of these grissini without the red peppers and with garlic and herbs. For another amazing bread with peppers, check out this Garlic Naan with Green Chiles. 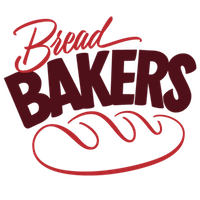 After the recipe, be sure to check out the rest of the #BreadBakers links. In the bowl of a stand mixer, whisk the flour, yeast, salt, peppers, garlic, parmesan, herbs, and hot sauce. Add the water and stir with a large spoon or a dough whisk. Move the bowl to the mixer and knead with the dough hook (can also be kneaded by hand) until the dough comes together and clears the sides of the bowl. Remove the dough from the bowl and hand knead a couple of times, adding more flour if it is too sticky. Place the dough in an oiled bowl or dough rising bucket, spray with spray oil, cover with plastic wrap, and place in the refrigerator for 6 to 24 hours. After an hour or two, if the dough has risen, push it back down. Mine did not rise until after about 18 hours. You can bake these either way. Preheat the oven to 375 degrees F, place a rack on the bottom rung of the oven and one rack just above it. Line two baking sheets with parchment, and sprinkle them with corn meal. Remove the dough from the refrigerator, and divide it into four equal pieces. Flatten each piece on your counter, which has been sprinkled with cornmeal. Cover two of the pieces with plastic wrap while working with the other two pieces. Pass the dough through the pasta machine on the widest setting. Place the dough back on the cornmeal sprinkled counter and flip in over a couple of times. Let it sit for a couple of minutes to dry a tiny bit. Run the dough through the fettuccine cutter of the pasta machine and toss the noodles in cornmeal. Separate the strands and place them lengthwise on a baking sheet. Do not stretch the strands. If they are too long, trim them to fit the pan. Brush the strands with olive oil, sprinkle with more cornmeal, and sprinkle lightly with the sea salt. Bake the baking sheets for 12 to 18 minutes until golden and the ends slightly lift up. Do not allow to get too dark. While the first two sheets are baking, begin preparing the second batch. Repeat with the next two dough pieces. There is no need to replace the parchment. Once all of the grissini are baked and cooled, turn off the oven, and place the wire racks in two of the baking sheets. Place the sheets back in the oven and allow the breadsticks to crisp for about an hour. If you have a gas oven, just leave the pilot light on. I have an electric oven. I turned my oven to 100 degrees F with the convection mode on for the last 15 minutes. Wait... there's hot Italian red pepper flakes??? Excuse me while I go hunt them down and order some. 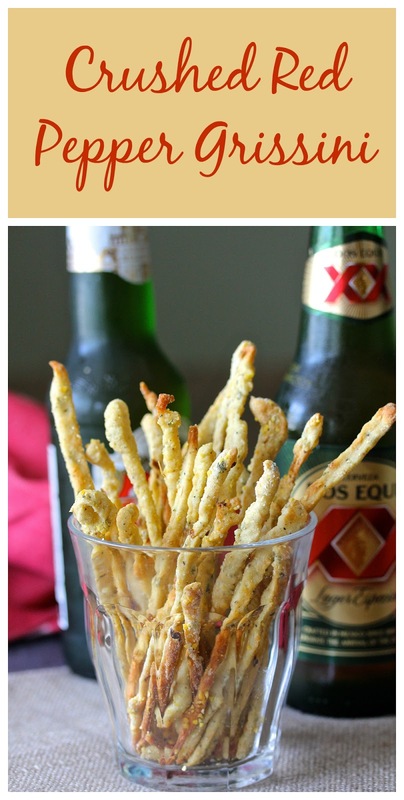 Then contemplate making this tasty grissini. I had no idea there were various heat indexes on red pepper flakes! I'm running out of room in my pantry. These are so fun to look at, and I bet even more fun to eat! Thanks Eileen. They're perfect for an appetizer. I love this one Karen! 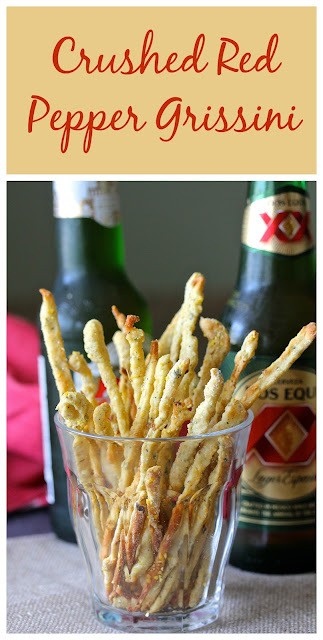 I put crushed red pepper in so many things but never thought of grissini! Hello Karen, your grissini looks hot, spicy and delicious. The combination of spices, peppers and cheese seems amazing. I would love to munch on them with my hot tea as well. Awww. Thanks Namita! They are the perfect tea time treat in my book. I can't tell you how many times I've been asked by a colleague if they could "borrow" my red pepper shaker! Thanks Cheri! That was the best part. You can keep them in an airtight container up to 4 days. Perfect party snack! Karen, spicy and skinny grissini look amazing. Its about time I got that past machine out and dusted it :) Wouldn't mind having some with wine. Perfectly made grissini. They look so addictive and delicious. Thanks Pavani. It's really hard not to eat them all in one sitting. Your grissini are perfection! I recently got a pasta maker, not used it yet, but this will be THE recipe I'm going to make first. I think it's the perfect recipe to break in that pasta maker. These look amazing. I love crushed red peppers too so I need to make these! They are pretty much my favorite food group.